adidas hit a home run with the introduction of the Springblade last year, and now they&apos;re taking the one-of-a-kind outsole technology even further. The adidas Springblade Razor carries over the innovative outsole setup of the original model, keeping the 16-blade design intact. Designed to propel runner&apos;s forward with high levels of energy return, the Springblade outsole quite literally functions like a spring. As the wearer&apos;s foot impacts the ground, the blades coil in, before releasing a bouncy, forward-moving release during the transition. 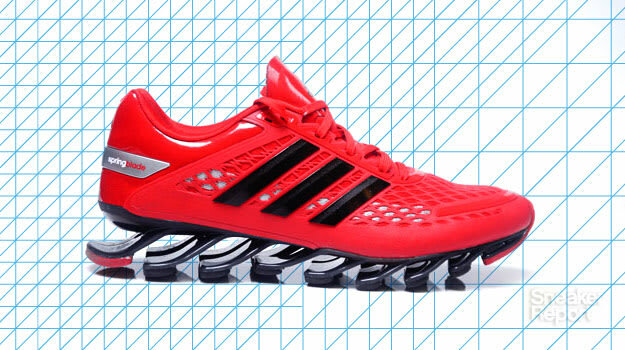 The real changes of the adidas Springblade Razor come in the form of its upper. The original SpringBlade model made use of a techfit construction, but the Springblade Razor utilizes a breathable mesh with a durable, razor-like SprintWeb shell. The SprintWeb overlay is loaded with perforation points, allowing air to flow freely and providing a cool, breezy feel that is perfect for spring and summer runs.